Wet the PUMIE stone in water. Gently rub the stain away using back and forth strokes until the deposit disappears. Clean stick of residue in bowl water or hold under faucet. 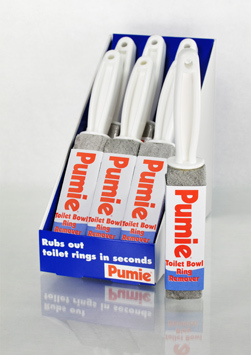 Hang or place PUMIE with other cleaning supplies for periodic bowl cleaning. CAUTION. Some colored porcelain bowls are fragile and may be damaged by abrasive cleaning materials. Test a small area before proceeding. Works through gentle abrasive action. Shapes easily to flat or curved surfaces. Scale and rust on metal work and piping. Rids porecelain bowls of rust and lime buildup. Quickly shapes to curved or flat surfaces. Safe for hands. Safe around children and pets.